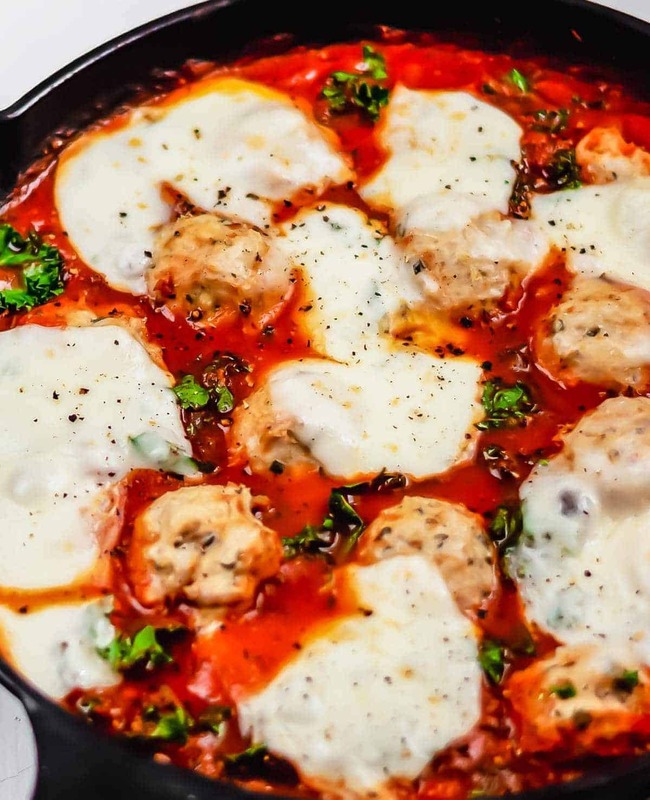 Italian Baked Chicken Meatballs are my favorite easy and amazing Chicken Meatballs Recipe. 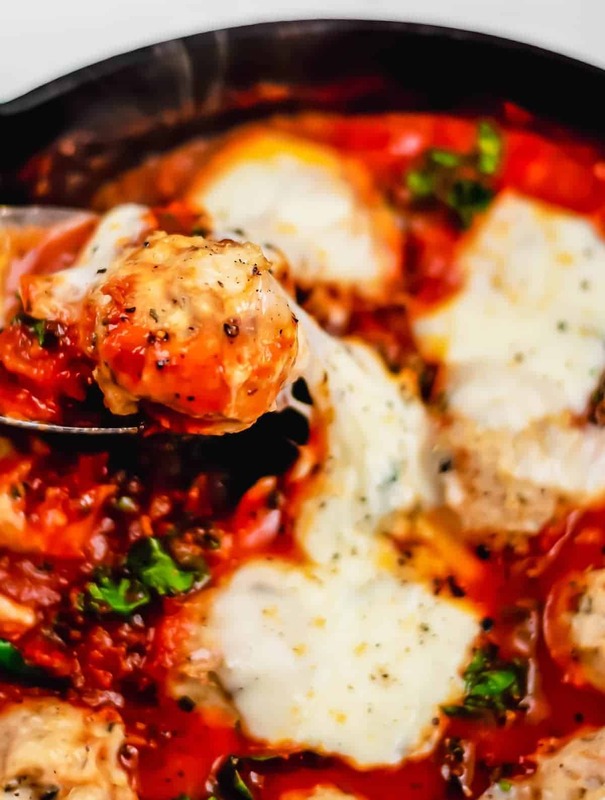 This recipe for Spicy Italian Chicken Meatballs brings you straight to Italy with soft meatballs, rich sauce, and ooey-gooey cheese. Most often, meatballs are made with sausage or beef, but chicken is a great option for reduced fat and it’s inexpensive, too. Chicken Meatballs are one of my favorite things to make for game day, holidays, ore even just a fun dinner at home. 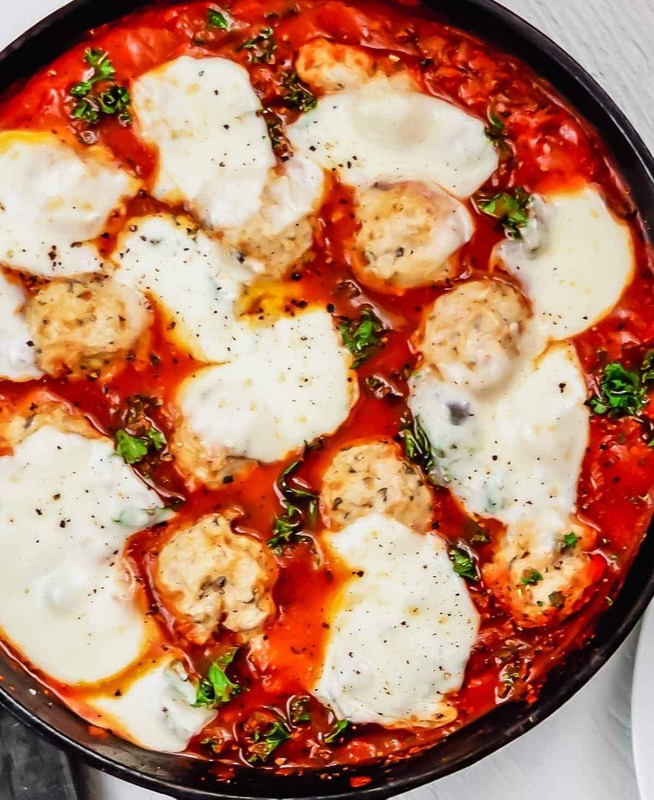 I love this Spicy Italian Baked Chicken Meatballs Recipe because it’s bursting with flavor, so easy, and make in one pan! 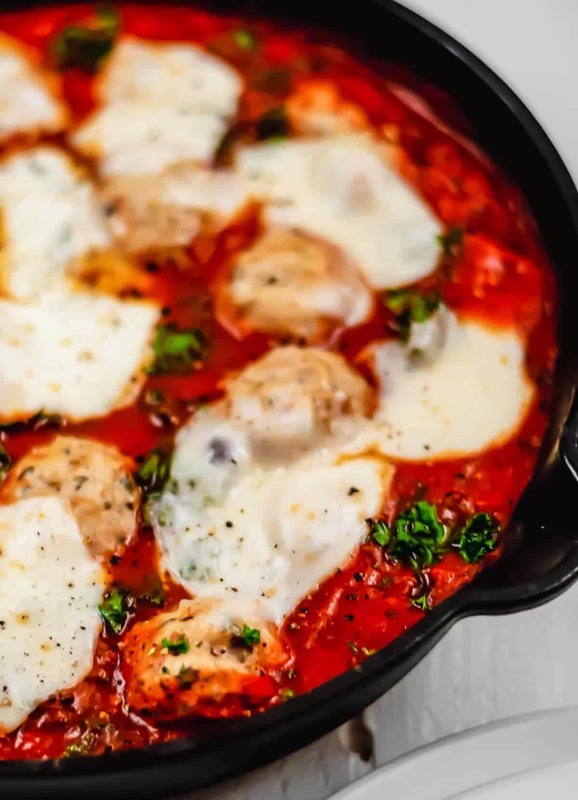 If you’re like me and love a great meatball recipe, these cheesy baked meatballs will knock your socks off. See below for how to make them as spicy or as mild as you’d like, making them perfect for kids or adults alike! 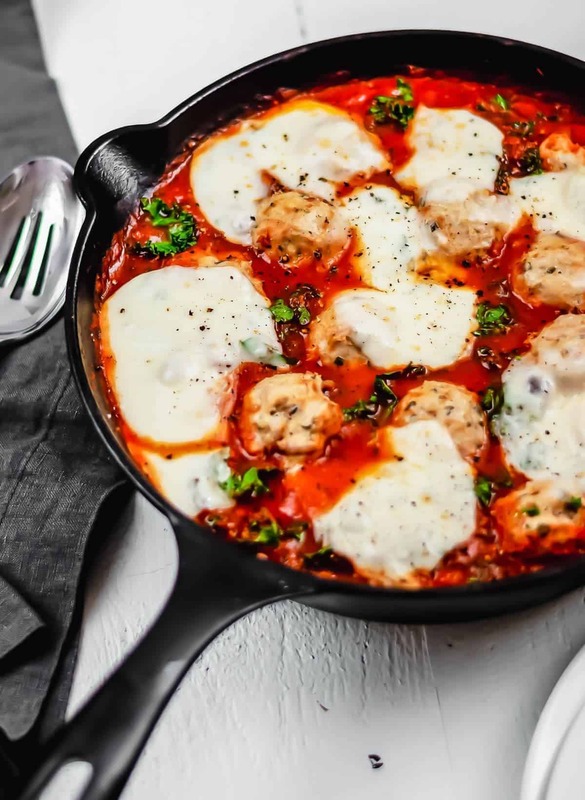 The hot red sauce that the chicken meatballs are swimming in is great for enjoying with your favorite bread or over pasta. 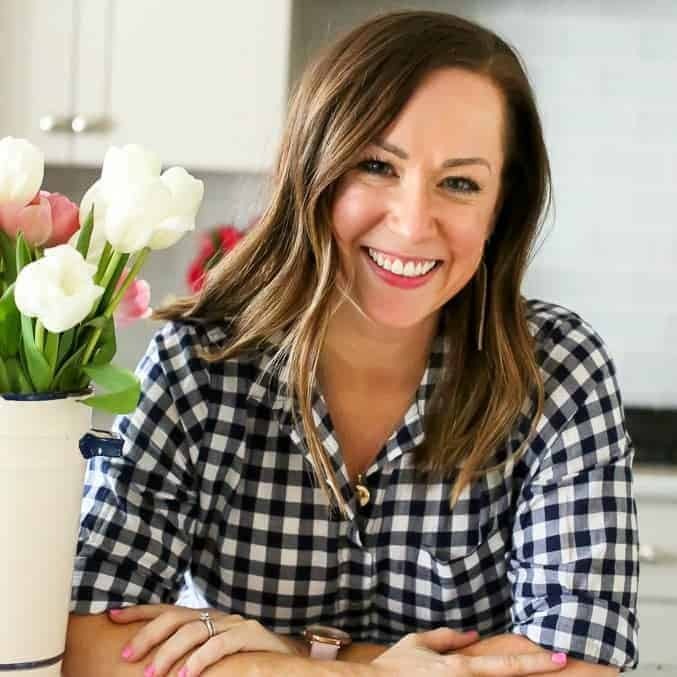 Not a fan of spicy foods or cooking for young kids? Simply leave out the red pepper flakes or adjust to your liking. 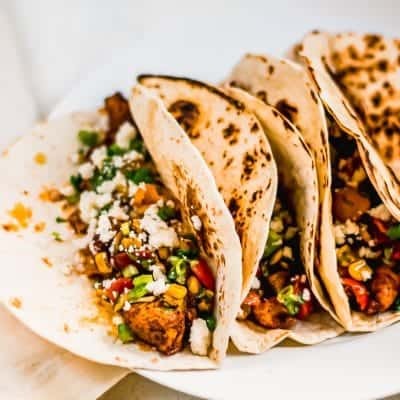 You can really customize this recipe to make it perfect for your family. Something about meatballs just makes the meal more fun! The little morsels are loved by kids and feature the adult twist of a little heat. 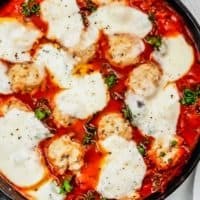 Spicy Italian Chicken Meatballs are a fun way to get the whole family interested in what’s for dinner. 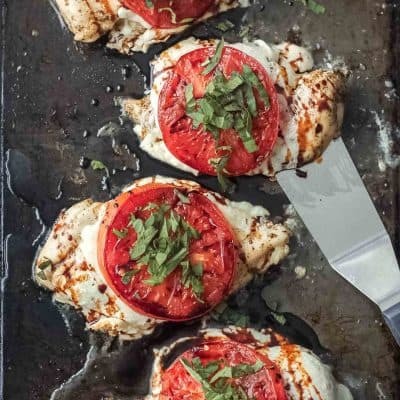 Whether serving as an appetizer or main course, you’re sure to love this recipe. There are a couple aspects to this chicken meatballs recipe that makes it healthier than your average meatballs. Here are a few reasons we love it for its healthy appeal as well as its flavor! 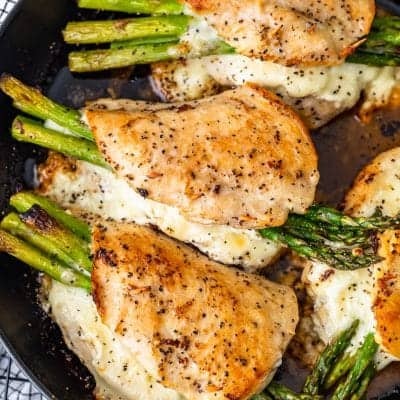 Made with chicken instead of beef/pork saves on calories and fat. Baking your meatballs instead of frying makes a HUGE difference with the amount of fat, but doesn’t sacrifice any flavor. This recipe for Spicy Italian Chicken Meatballs includes a whole bunch of kale, so in the excitement for meatballs, your family won’t even realize they’re getting lots of nutrients too. I love sneaky ways to make recipes slightly more healthy, and this bunch of kale does just the trick. Genius, right? Making meatballs can be a messy business. Be sure to set up your baking sheet, remove any rings, and wash your hands thoroughly before getting started. My favorite trick for making meatballs all the same size is to use a cookie scoop then gently roll to smooth out the edges. Before using the cookie scoop, you can lightly spray your hands as well as the scoop with nonstick spray. I find this helps the entire process to be a bit less messy! Once the meatballs are cooked, add them to the sauce to soak up all the tomato flavor. Then, top off the healthy tomato and kale sauce with a hearty amount of mozzarella cheese. The cheese counters the spice and adds great texture when combined with the crunchy kale and smooth sauce, making the perfect bite. Life is all about balance, right? 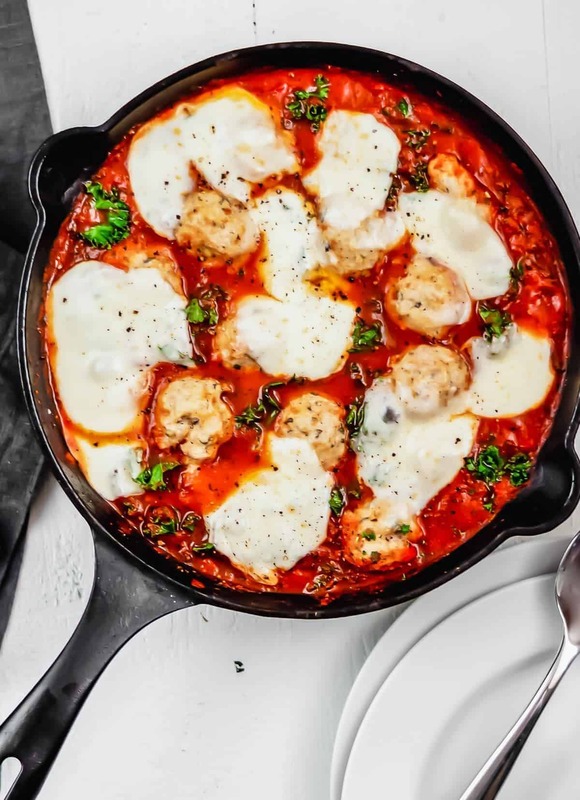 There are endless options for what will taste amazing with these Italian Chicken Meatballs, but here are some recipes we are currently loving for serving alongside. In a large bowl, combine the breadcrumbs and milk. Let sit for 2 minutes while you assemble the other ingredients. Combine the egg, basil, garlic powder, oregano, Dijon mustard, black pepper, salt, and red pepper flakes with the breadcrumb mixture. Add the chicken and gently use your fingers to mix together until just combined. Roll into 1 1/2 inch meatballs. Place the meatballs on the baking sheet and bake for 15-18 minutes, until the meatballs just starting to brown and are cooked through. While the meatballs are baking, prepare the sauce. Heat a large skillet on medium heat and add tomato sauce, oregano, red pepper flakes, and salt until simmering. Reduce the heat and cook, stirring occasionally, until the meatballs are done baking, about 10 minutes. Spoon the meatballs into the sauce, add the kale and cook, stirring gently, until the kale has wilted. Top with mozzarella cheese and cook, without stirring, until the cheese has melted. Serve meatballs over pasta of choice or with crunchy bread. This recipe was contributed by Sarah at Salt Jar. Thanks Sarah! Be sure to check out her site. What an easy dinner. My family devoured it. 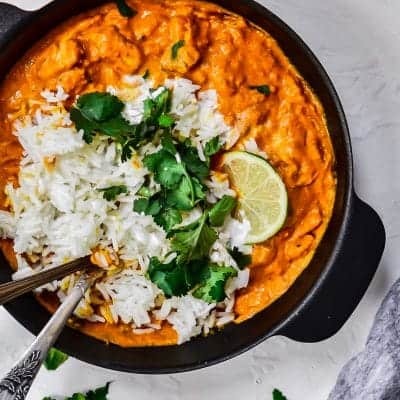 The flavors in this recipe have me all heart-eyed! Thank you so much! I will be saving this recipe! It was a hit! I love this as a lighter alternative to beef! These will be a great appetizer. This hit the spot! Such a good recipe.